The story has added layers so fast I didn’t have a chance to initially comment on the blatantly misleading tweets from pro-abortion presidential-wannabe Sen. Kamala Harris (D-Ca.) Maybe it was for the best. Even when you very specifically point out where somebody grotesquely misrepresents someone else’s statement—in this case Harris egregiously distorted what Supreme Court nominee Judge Brett Kavanaugh had said—you risk giving the lie more oxygen. So we won’t go into the specific distortion (suffice it to say Sen. Harris left out two key words in quoting Judge Kavanaugh) but rather talk about just some of the fallout. It’s bad enough for her that Politifact says Harris’ statement is “false.” But it got far worse for the freshman senator. For those outside the Beltway, the Post has a 1-4 Pinocchio scale in checking statements of fact, not opinion. So why bring up Harris’s clumsy, ham-handed attack at all? For reasons that are obvious and not-so-obvious. When Republicans are nominated to the Supreme Court, character assassination is the coin of the Democratic realm. If Judge Kavanaugh is confirmed, the High Court will be more conservative and less likely to read its own policy preferences into the Constitution. Even many pro-abortionists understand that the “right” to abortion Judge Blackmun found embedded in various penumbras and emanations was essentially a “right” created out of whole cloth. Justice Blackmun considered it his duty to bring abortion laws up to date. How? By obliterating them. Pro-abortionists fear Judge Kavanaugh will not share Blackmun’s appetite for legislating from the bench and thus believe this justifies any kind of attack, no matter how low, unfair, or malicious. Another reason is there are countless stories about how likely (as in very likely) Judge Kavanaugh is to be confirmed. But pro-abortion Senate Democrats and their allies are just warming up. Remember it was not until after Clarence Thomas barely made it through the Senate Judiciary Committee that what Thomas would call a “high-tech lynching” rolled into action. Finally, even if Judge Kavanaugh becomes Justice Kavanaugh, from the Democrats’ perspective, that can be put to use. How? By further poisoning the political environment and, potentially, energizing their base. 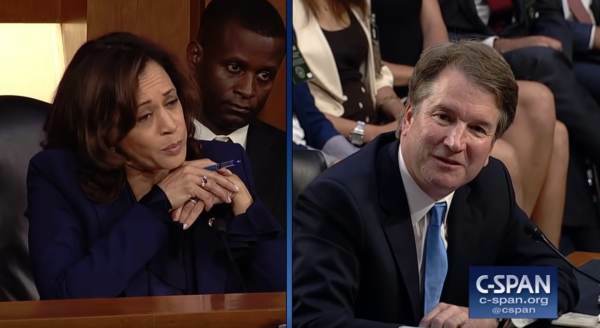 Oh, by the way, Senator Harris has offered no apologies, nor has Sen. Cory Booker (D-NJ) for his equally fanciful attacks on Judge Kavanaugh. It’s always good to know your enemy.